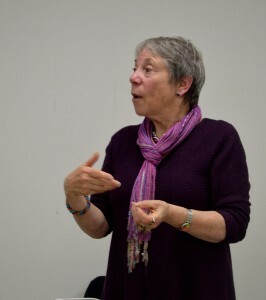 At the April 11th SCBWI seminar on writing biographies for early and middle-grade readers, Patricia Lakin first took us back in time with a mental and physical leap showing us her sprightly vigor as a seventy-one year old prolific author. She took us back to her school-age childhood in Boston where female teachers were not allowed to work if they were married and children were disciplined with a rattan rod. Patricia never got the rod, however, as she was “a mouse” hiding behind her desk, avoiding notice. She endured uninspiring writing lessons and a stifling fear of spelling error to somehow blossom, after a teaching career, to emerge from behind her desk as a children’s book author. Patty Lakin signed up for classes at the “New School” taught by the now famous “Bunny” Gable. She persevered for ten years, honing her craft by gathering good advice from critiques. While listening to or reading the works of an admired author, she learned to ask herself this important question: “What is it that I like about this story?” And she learned to recognize and correct in her own written manuscripts the things that she disliked in other authors’ works. 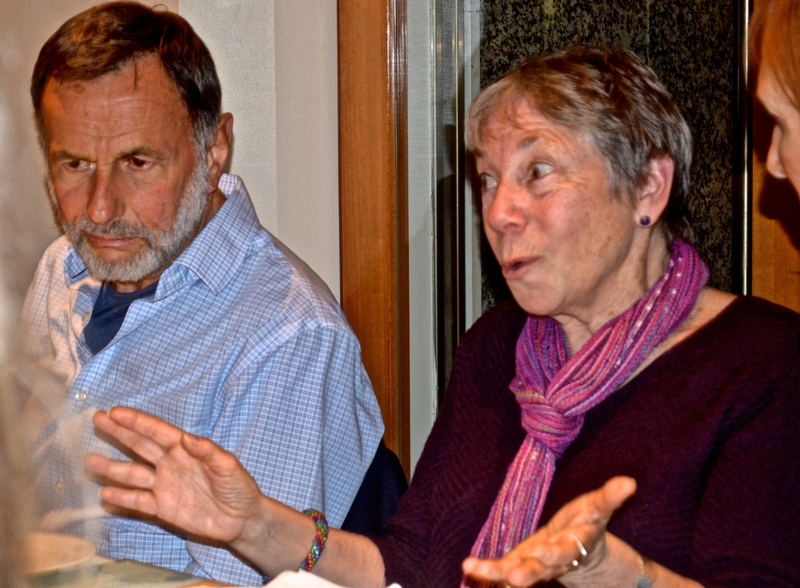 A keen critique group is key to a developing author, she emphasized, and shared that she still meets regularly near her home in New York with her kind, but honest, critique group. Patricia Lakin saves her rejection letters, especially the personalized ones that contain nuggets of advice. These rejection letters can lead to acceptance letters if taken in the right spirit. Some letters explain why the work was rejected or contain a suggestion for improving the story. Her first published story, “Don’t Touch My Room,” was initially rejected and then later accepted at a later date. Some submissions are rejected because the publishing house doesn’t have a place for it in their line-up or, as was the case with a Dr. Seuss biography that she wanted to publish, the rights to the story or illustrations had not yet been acquired. Permissions can be tricky. The estate of Ted Geisel, for example, strictly limits when and where his photos and illustrations can be used. Patricia Lakin does all of her research from her computer. The internet is a wealth of information and it is much easier nowadays to track down individuals who may have a piece of information that may be valuable to you and your story. Patty will often highlight a lesser-known detail or character in the life story of a famous person. 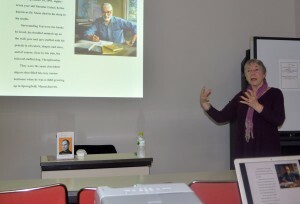 For example, while researching the biography of Steve Jobs, she tracked down the daughter of Steve’s favorite grade school teacher and was given permission to use a photo in her book by that daughter who was thrilled that her mother was given the recognition as a key encourager of the young genius. While writing a biography, Patty searches for a way to create a full circle of the subject’s life. Helen Keller, for example, when she was very young and was full of anxiety and frustration with a world that to her was dark and silent, would throw herself down on the grass outside and let the smells and touch of nature soothe her. In a key moment, when she was older and had climbed a tree just before a violent storm struck, Helen clung to the branches, bewildered and confused that what had so often soothed her could suddenly turn against her. The touch of the hands of her teacher calmed her fears and rescued her from her perilous perch in the tree. 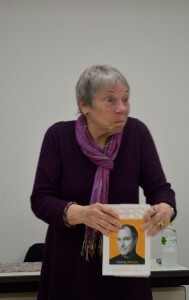 Patty will often find a connection between her own life and the life of the person for whom she is writing a biography. This helps her focus on details that matter to her and help to bring a liveliness and immediacy to her writing. For the biography on Steve Jobs, for example, Patty recalled that she loved the calligraphy classes she had taken and in her research, she found that, while attending Reed College, Steve Jobs had also taken calligraphy from former monk, Robert Palladino. His love of fonts had prompted Steve to make sure that the users of the new Apple computer had a variety of fonts from which to choose. At the end of the evening, we leapt back into the present and peppered Patty with questions about the writing process and the possibility of publication. 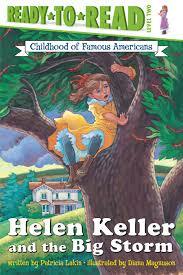 She shared with us that she still hopes to publish a middle-grade work of fiction. She has written a story about a very short character but may have to wait a longer time to get that one published. In the meantime, she can be pleased with the pile of books that have already been published as she continues to bring those who have passed on back to life in the pages of her books.